Rachel graduated from the University of Wales Institute Cardiff in 2006 with a BA honours in Contemporary Textile Practice. After leaving Cardiff she moved back home to Devon where she pursued a career as a freelance surface pattern designer, she has successfully designed prints for the UK and USA fashion and textile industry. 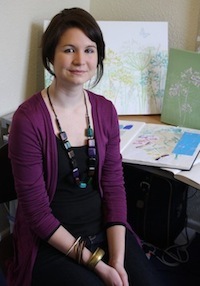 She now works as a ladieswear graphic designer creating commercial prints for the UK highstreet. The Devonshire countryside has had a huge influence on her work. She was lucky enough to have her own studio at her parent’s home in Devon after she graduated, where she was able to develop her own unique style. She now lives with her partner in Leicestershire, and in January 2010 she set up her own business creating beautiful hand embellished artworks. 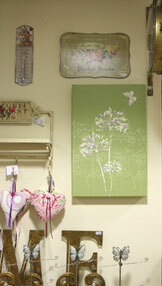 She regularly travels back down to Devon and all her designs are printed by a local Devon based company. She has stockists based in the South West, Warwickshire and Brighton, and she also sells her work at local craft fairs and markets. She is inspired by pattern and layering and this is what makes her work so unique. To bring her prints to life she applies collage and free machine stitch to create an intricate layered effect, each piece of collage has been carefully selected to complement and enhance the botanical print. Rachel’s passion is to create truly beautiful and captivating designs that will transform your home. Please get in touch if you would like to find out more.